-A place where photographers and cinematographers can come to find the perfect song for their story with the click of a button. Mraz, Bob Dylan, Frank Sinatra, Christina Perri, Colbie Callait, Mat Kearney, American Authors, Phillip Phillips, LMFAO, The Band Perry, Marvin Gaye and many more; as well as songs by well-known indie artists like Ingrid Michaelson, Tyrone Wells, and The Afters. -The only company that licenses songs from labels Universal Music Group, Sony, and Warner Music Group; and large publishers like Universal Music Publishing Group, Sony/ATV, Warner/Chappell, Kobalt, BMG Rights Management, and Roundhill. 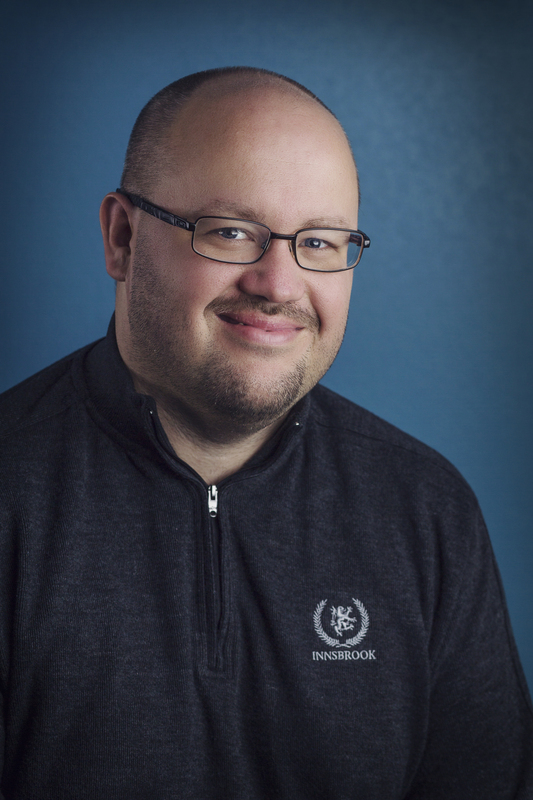 Matt Thompson is the CEO and Co-Founder of Songfreedom. Songfreedom was the first and still only pre-cleared licensing platform offering sync and streaming rights from all major labels, publishers, and dozens of indies to underserved markets such as event filmmakers, photographers, schools, churches, indie filmmakers, and corporate videos. Matt, 35, founded Songfreedom in April 2010 and remains active in the company’s day-to-day management. He established Songfreedom on the belief of doing the right thing for both musicians and the creative video community. He wanted to create a place where they could support one another with their art and make music more accessible. This idea of bringing arts together and serving the underserved still lives strong within the Songfreedom culture today. In keeping with helping artists, in 2013, Matt co-founded U Management, an artist management company along with Milton Hopkins. Their artist roster boasts amazing artists, writers, and producers signed with companies like Sony, Ultra, and many others. Matt’s working knowledge of the licensing side, coupled with his hands-on work with the artist representation side has led to very successful companies that have been disruptive to their respective industries. Matt Thompson, CEO and founder of Songfreedom, is not afraid to leap down paths others fear to tread. From young manager to music licensing entrepreneur, Thompson used a natural inclination for persuasion and sales to become a leading force in the democratization and expansion of music licensing. Thompson was high school friends with a singer whose career began taking off. He asked Thompson, who had a head for business, to get involved as a manager. Thompson agreed, though he knew he was in for a real challenge. “We were barely 20 years old and we were just some punk kids who didn’t know anything,” he recalls with a laugh. “Here’s my buddy with the amazing voice, I thought, and I’m going to keep beating down doors until I get what I want.” What he wanted, and what he got, were offers from several major labels for recording contracts. The persistence came into play again when Thompson left a successful, but unsatisfying career in banking and finance to pursue a wacky idea suggested by a videographer friend. Instead of forcing professional videographers to use canned music for soundtracks to wedding or other event footage, why not create a way for people to get licenses for a limited but common set of usages, at a convincing price point? Thompson quit his job, and the two friends met regularly at a local bakery, scheming what it would take to make this service a reality. Neither had any background in music licensing or law, so Thompson reached out to another friend, Milton Hopkins, who had worked in licensing in LA and Austin, for advice. He got them some contacts. Then Hopkins and Thompson got to work. “From that point on, it was all about selling the concept and being as persistent as possible. Eventually someone would say yes,” Thompson recounts. “I’d build rapport with really smart people and then I’d slowly work my way up the ladder to a final decision maker.” The concept was novel, a new kind of right that most labels and publishers weren’t sure what to make of. Yet, as Thompson predicted, the tide turned at last. He got a EVP at a well-respected record label on the phone, who listened to Thompson’s pitch and replied that he had to check with some managers, but that he thought it sounded like a good idea. Many other yeses followed, until Songfreedom had all the majors and a huge catalog of wildly popular music (even the coveted Sinatra blessing). “When Warner cleared Jason Mraz for us, who was a super hot item at the time, I knew we had something,” explains Thompson. Songfreedom licenses Top 40, iconic, indie, epic cinematic, and other amazing music so you have the freedom to choose the type of music that best fits your video. No hoops. No huge fees. Just music. Songfreedom has a new way of pricing songs, to serve more diverse audiences with a wider range of budgets. With its growing catalog of licensed, legal music for marketers and filmmakers, Songfreedom now sets different rates for different users, creating affordable alternatives to piracy and letting people use their favorite hits, not knock-off tracks. It reflects a major shift in music usage toward rapidly evolving individual use on video platforms and apps, which demand new frictionless solutions to licensing music. Offering close to 100 different pricing scenarios makes these solutions available to more precise market segments. “People from all walks of life actually want to license music, so we’re pricing it to encourage that,” said Songfreedom CEO Matt Thompson. As video technology gets easier and more ubiquitous, sound-to-image licensing is still dominated by convoluted negotiations and unpredictable prices. Songfreedom is the first and largest company to provide turnkey solutions that allow the songs everyone knows and loves to be legally and publicly shared—so video creators encounter less hassle, and rights holders get more income. “Developing these pricing options is our response to two trends,” continued Thompson. “One, casual music consumers are learning about licensing and piracy and their own responsibility to be honest and lawful. And two, we have so many different kinds of customers now”—not just wedding videographers and independent cinematographers, but teenage vloggers, priests on mission trips, corporate trainers, non-profit fundraisers, realtors, podcasters, Instagram users, marketers, ad agencies, and more. Here’s how it works: A prospective customer wants to add a favorite track to a video--say, Maroon 5’s “Sunday Morning,”--and goes to Songfreedom to find out more about licensing. When she clicks the “buy” button, Songfreedom asks her to declare her purpose and identify herself as an individual, non-profit, or corporation. Songfreedom takes it all into account and then shows whether “Sunday Morning” is available to her and for how much. Some songs’ licenses cost as little as $15, while others cost up to $1500. Songfreedom acquires, bundles, and sells music synchronization rights to videographers, photographers, and other professional clients. Founded in 2010, it expands soundtrack possibilities for a wide range of uses, audiences, and budgets to include legally licensed songs—from new indie tracks to Top-40 hits. It’s the first company to offer pre-cleared sync licenses from labels like Universal Music Group, Sony, and Warner Music Group; and large publishers like Universal Music Publishing Group, Sony/ATV, Warner/Chappell, Kobalt, BMG, Disney, Downtown, and Roundhill. Songfreedom makes it possible for everyday people to use great music in videos without the unwieldy, expensive process of obtaining rights, and it’s all available online. There’s a quiet revolution underway. In the old days, you had to be a major Hollywood filmmaker, TV studio, or ad agency with a wad of cash to acquire rights to mainstream music. 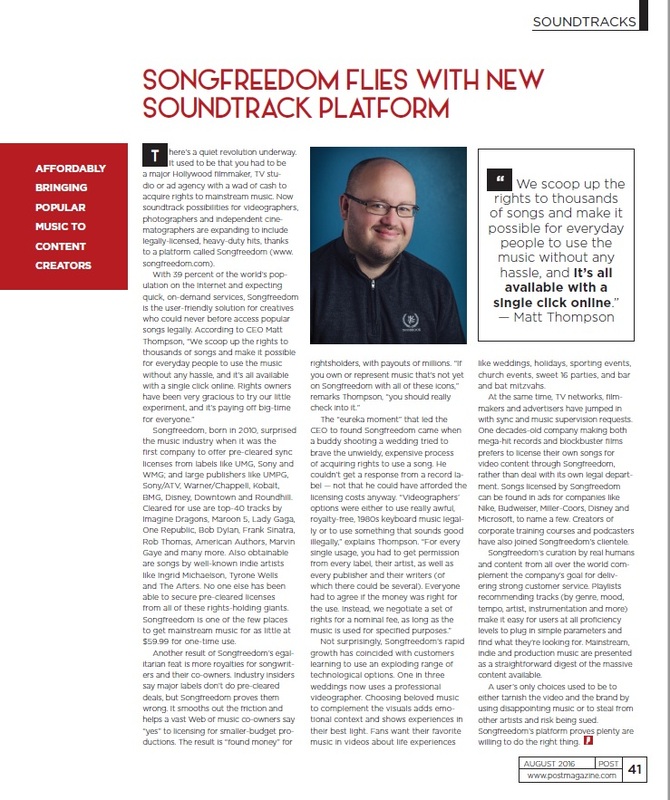 Now soundtrack possibilities for videographers, photographers, and independent cinematographers are expanding to include legally licensed, heavy-duty hits, thanks to a platform called Songfreedom. Songfreedom, born in 2010, surprised the music industry when it was the first company to offer pre-cleared sync licenses from labels like UMG, Sony, and WMG; and large publishers like UMPG, Sony/ATV, Warner/Chappell, Kobalt, BMG, Disney, Downtown, and Roundhill. Cleared for use are top-40 tracks by Imagine Dragons, Maroon 5, Lady Gaga, One Republic, Bob Dylan, Frank Sinatra, Rob Thomas, American Authors, Marvin Gaye and many more. Also obtainable are songs by well-known indie artists like Ingrid Michaelson, Tyrone Wells, and The Afters. No one else has been able to secure pre-cleared licenses from all of these rights-holding giants. Songfreedom is the only place to get mainstream music for as little at $59.99 for one-time use. Not surprisingly, Songfreedom’s rapid growth has coincided with customers learning to use an exploding range of technological options. One in three weddings now uses a professional videographer. Choosing beloved music to complement the visuals adds emotional context and shows experiences in their best light. Fans want their favorite music in videos about life experiences like weddings, holidays, sporting events, church events, sweet 16 parties, and bar and bat mitzvahs. At the same time, TV networks, filmmakers, and advertisers have jumped in with sync and music supervision requests. One decades-old company making both mega-hit records and blockbuster films prefers to license their own songs for video content through Songfreedom, rather than deal with its own legal department. Songs licensed by Songfreedom can be found in ads for companies like Nike, Budweiser, Miller-Coors, Disney, and Microsoft, to name a few. Creators of corporate training courses and podcasters have also joined Songfreedom’s clientele. Songfreedom’s skilled curation by real humans and content from all over the world complement the company’s enthusiasm for strong customer service. Playlists recommending tracks (by genre, mood, tempo, artist, instrumentation, and more) make it easy for users at all proficiency levels to plug in simple parameters and find what they’re looking for. Mainstream, indie, and production music are presented as a straightforward digest of the massive content available. A videographer’s only choices used to be to either tarnish the video and the brand by using disappointing music or to steal from other artists and risk being sued. Songfreedom’s platform proves plenty of the “little guys” are willing to do the right thing—to pay reasonable prices to use music legally.